PNNL researchers have developed a porous, sponge-like nanomaterial made of silicon that could help lithium-ion batteries run longer on a single charge by giving the batteries' electrodes the space they need to expand without breaking. PNNL researchers have developed a porous, sponge-like nanomaterial made of silicon (shown here under a microscope) that could help lithium-ion batteries run longer on a single charge by giving the batteries' electrodes the space they need to expand without breaking. RICHLAND, Wash. — The lithium-ion batteries that power our laptops and electric vehicles could store more energy and run longer on a single charge with the help of a sponge-like silicon material. Researchers developed the porous material to replace the graphite traditionally used in one of the battery's electrodes, as silicon has more than 10 times the energy storage capacity of graphite. A paper describing the material's performance as a lithium-ion battery electrode was published today in Nature Communications. "Silicon has long been sought as a way to improve the performance of lithium-ion batteries, but silicon swells so much when it is charged that it can break apart, making a silicon electrode inoperable," said Pacific Northwest National Laboratory Fellow Ji-Guang "Jason" Zhang. "The porous, sponge-like material we've developed gives silicon the room it needs to expand without breaking." Rechargeable lithium-ion batteries have two electrodes: one that's positively charged and made of lithium and another that's negative and typically consists of graphite. Electricity is generated when electrons flow through a wire that connects the two. To control the electrons, positively charged lithium atoms — which scientists call ions — shuffle from one electrode to the other through another path: the electrolyte solution in which the electrodes sit. The chemistry of lithium-ion batteries limits how much energy they can store. To increase the battery's energy capacity, researchers are looking at new materials such as silicon. A lithium-ion battery with a silicon electrode could last about 30 percent longer than one with a graphite electrode. Today's average electric vehicle could drive about 130 miles on a single charge if it used a lithium-ion battery with PNNL's silicon electrode. Unfortunately, silicon expands as much as three times in size when it charges, creating pressure within the material that causes it to break. Many scientists have attempted to make tiny, nano-sized battery components with the idea that the smaller size would give silicon enough room to expand, but these efforts haven't produced market-ready technologies. Zhang and his PNNL colleagues wondered if a sponge-like silicon electrode would do the trick. Others had etched pores into a silicon electrode's surface, but hadn't succeeded in creating holes throughout the material. So they approached Michael Sailor, a University of California, San Diego chemist whose research includes using porous silicon to detect pollutants and deliver drugs, for help. PNNL used Sailor's method to create porous silicon — placing thin sheets in a chemical bath to etch out tiny holes throughout the material — and then coated the result with a thin layer of conductive carbon to make their electrodes. Next, the team collaborated with materials scientist Chongmin Wang, who specializes in using in-situ transmission electron microscopes at DOE's EMSL, the Environmental Molecular Sciences Laboratory at PNNL. Wang uses powerful microscopes to record close-up videos of tiny batteries, allowing researchers to better understand the physical and chemical changes that batteries undergo as they operate. Wang put the team's sponge-like, carbon-coated silicon electrode through a series of charges and discharges under the microscope's careful eye. The team observed that while being charged, the new electrode mostly expanded into the empty spaces created by the material's porous structure. The outside shape of the electrode only expanded by 30 percent — much less than the 300 percent usually seen in silicon electrodes. And the new electrode didn't break down. 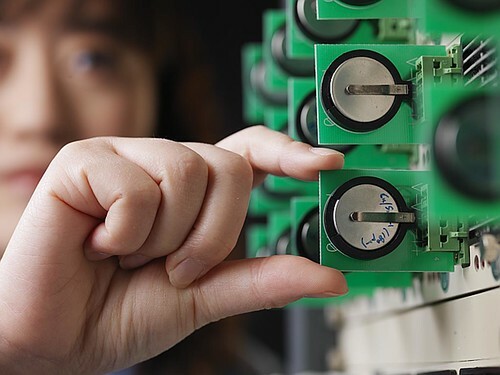 After more than 1,000 charge-and-discharge cycles, the electrode maintained more than 80 percent of its initial energy storage capacity. Next, Zhang and his colleagues plan to develop a larger prototype battery with their silicon sponge electrode. Part of that effort will involve creating a more streamlined production process so their new electrode can be made at a reasonable cost. This research was funded by the Department of Energy's Office of Energy Efficiency and Renewable Energy. Reference: Xiaolin Li, Meng Gu, Shenyang Hu, Rhiannon Kennard, Pengfei Yan, Xilin Chen, Chongmin Wang, Michael J. 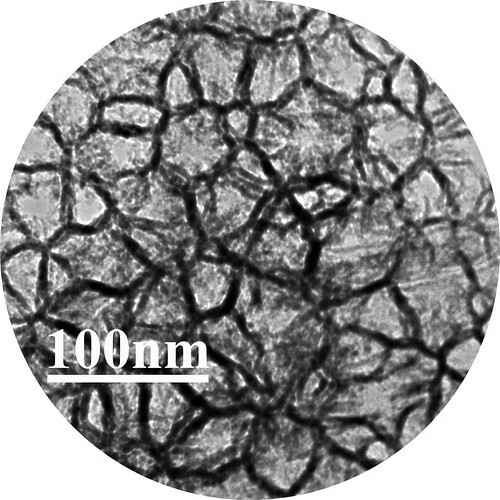 Sailor, Ji-Guang Zhang and Jun Liu, "Mesoporous Silicon Sponge as an Anti-Pulverization Structure for High-Performance Lithium-Ion Battery Anodes," Nature Communications, July 8, 2014, DOI: 10.1038/ncomms5105.